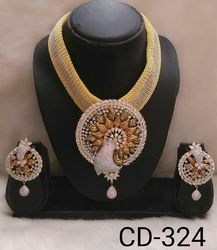 American Diamond Earring Pendant Set in Imitation Jewellery. Our Designer Pendant Set crafted by the experienced professionals keeping in view the varied requirements of the clients, these have gained huge demand in both, national and international market. Credited as a noted firm, we are willingly engaged in providing to our patrons AD Pendant Set in several sizes and designs.